Burial insurance is the simplest form of life insurance that seniors can buy. Its application takes a few minutes online or over the phone. Buyers are asked a few questions regarding their general health and living for the level benefit policies. On the other hand, there are no questions when it comes to the graded benefit policies. Burial insurance is the most popular among the seniors aged between 85 to 90 years. In this article, we will look at why you should look for life insurance coverage over 85. Remember we can’t predict the future. It means you need to be prepared for any eventuality, including death. Having burial insurance enables you to have of mind knowing that your family won’t incur lots of debt covering your funeral and burial costs. A basic funeral service can end up costing thousands of dollars. Some people choose to prepay for their funeral, but you should realize that most of us don’t often think this far ahead. Pre-payment ensures that your loved ones don’t have to incur great financial costs planning for the funeral. However, prepayment presents its own risks. Choosing to own burial insurance for seniors lifts a huge financial burden from your loved ones and yourself. Burial insurance provides some form of financial security to your loved ones when you pass away. It’s important that you consider what can happen if you were to die suddenly. If your loved ones rely on your income, we advise that you get an adequate coverage. It will make sure that your loved ones have something to cover for the final expenses. 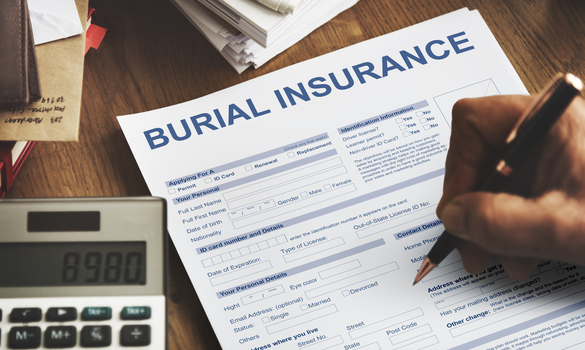 If you have a business, it’s important that you have burial insurance. It will cover your obligations and prevent your hard work from going to waste. If you have a partnership with someone else, it’s good that you both have this coverage. That way, none of you will be left with a heavy financial burden in the case one of you passes away. Some seniors use burial insurance as an investment tool with other life policies. These policies are tied to particular investment products. Depending on the product’s performance, the policyholder will receive specific payments. We advise that you read the fine print before you purchase this type of insurance. It will enable you to know the potential returns and risks before you commit yourself. In the unfortunate event that you die, your debts will still need to be repaid. If you and your partner have cosigned other loans or mortgages, the remaining spouse will be responsible for the repayments. The outcome is creditors trying to collect payments from your estate. Your debts may get repaid this way, but your heirs will remain will less of what you intended them to get. Owning burial insurance enables you to prevent these incidences by providing them with funds for your funeral. Nobody can predict the future. However, purchasing burial insurance enables you and your family to prepare for any eventuality. A small policy will help you sleep easier at night knowing that your loved ones have protection in the event the worse happens to you. One reason why people avoid owning burial insurance is that they find it expensive. The truth is that this coverage is affordable for most people, including seniors. For example, the application takes a few minutes over the phone or online. You’ll be asked a few questions if you want the level benefit policies and no questions for the graded level benefits. In the case that you have no savings, it’s a good choice if you can afford to pay premium payments and prevent your loved ones from bearing the cost of debt as they try to pay for your funeral and burial expenses. Owning burial insurance ensures that your loved ones have the ability to pay for funeral and burial costs. You can purchase it online or over the telephone without having to wait for an insurance firm doctor’s exam. For seniors, getting burial insurance doesn’t require any medical history at all. As an applicant, you’ll be asked about your age, any serious medical conditions and if you smoke. Acceptance is guaranteed for some policies, while others require a two-year premium-paying period before any collections are possible and will only cover buyers to 100 years of age.